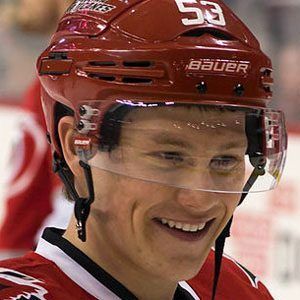 Seventh overall pick of the Carolina Hurricanes who entered the NHL as the youngest player in the league and shortly after appeared in his first All Star Game as the youngest player to ever play in that game. He played his junior hockey as a team member of the Kitchener Rangers starting in 2008 before being drafted in 2010 for the NHL. Not only was he the youngest to play in the NHL All Star Game, he was the youngest to play in any All Star Game across all four major North American sports. He grew up in a big family with four sisters and one brother. He replaced fellow Canadian hockey player Sidney Crosby in the 2011 All Star Game when Crosby was injured.